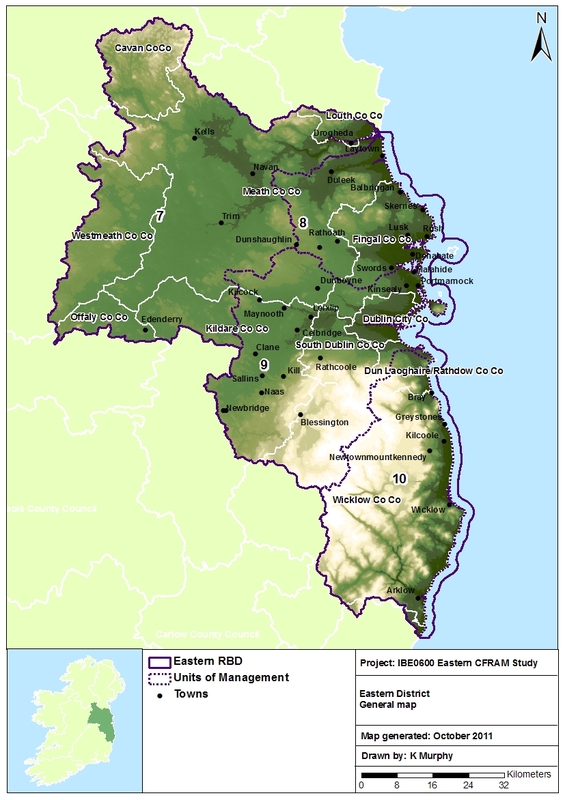 The Eastern Catchment Flood Risk Assessment and Management (CFRAM) study commenced in the Eastern district in June 2011 and will run until the end of 2016. 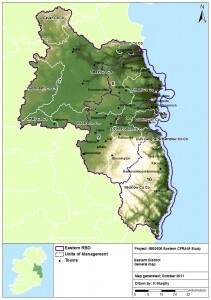 With a land area of approximately 6,300 km2, the Eastern district accounts for one tenth of the land area of Ireland. It is home to rich agricultural land, holiday coastline, the city of Dublin and the towns which form the Greater Dublin Area and its commuter belt. Around 1.6 million people, 40% of Ireland’s population, live in the Eastern district with the majority living in the Greater Dublin Area. Why is the study being carried out? Floods pose a risk to human life and wellbeing, often cause extensive damage to property and can have severe environmental consequences. The EU Floods Directive (2007/60/EC) is the driving force behind flood management throughout Europe and requires a catchment-based approach to assessing and managing flood risks. The Eastern CFRAM study has been commissioned in order to meet the requirements of the Floods Directive, as well as to deliver on core components of the 2004 National Flood Policy, in the Eastern district. What are the aims of the study? ensure that full and thorough public and stakeholder consultation and engagement is achieved. How will the study aims be achieved? A preliminary flood risk assessment was completed in 2011 to identify areas that need further assessment to determine their risk of flooding. For these risk areas, flood risk maps and flood hazard maps will be drawn up by 2014. Flood Risk Management Plans (FRMPs) will be developed by 2016. FRMPs will include measures in relation to flood prevention, protection and preparedness. Emergency response to flooding, recovery from flooding and incorporating lessons learned will be important elements of the FRMPs. Issues such as climate change, land use practices and future development will also be addressed in the FRMPs. The public will have a right to access the CFRAM programme information and to have their say in the development of FRMPs.